You may have been under the impression that a mobile keyboard is a simple utilitarian communications device, more or less devoid of personality. If iOS developers have anything to say about that — and given the sheer volume of novelty keyboards out there, they obviously do have something to say — keyboards are quickly becoming not only the medium but the message itself. The iOS keyboards below range from purely wacky to extremely useful, not to mention super fun. The vast majority of the selection below is free, while a couple have in-app purchases available. As with all installed keyboards on iOS, you must first install them and then give the iOS full access to them, in a two-step process that each vendor explains in detail. Are there times when text and emoji just aren’t enough? When you absolutely must have a cute kitten or puppy to express your thoughts? Then count on Riffsy’s GIF Keyboard to let your friends and associates know how you really feel. GIF keyboard lets you view and share GIFs via email and messaging services in addition to Twitter and other social networks. The app also has a pre-existing set of GIF collections tagged and ready for use. Emoji hints at the bottom of the interface let you move between sections to find the exact drooling, wagging tail you want. They’re even organized: One pane lets you save a collection and view your favorites, another specializes in hashtag emotions and others gather together holidays, music and more. A search box lets you choose from broad categories. You can also save any GIF you see online to your smartphone and then send it to your friends with your keyboard. Slash is a free, intelligent helper that makes it easy to share links and other information without switching apps. Just tap the forward slash (/) to access partners like Foursquare, Stickers, YouTube, Contacts, Genius, Google Search and Maps and others. Slash is integrated with a total of 15 apps so far, but the company warns there will be more. Slash works with messengers and social networks, including Messages, Email, WhatsApp, Twitter, Messenger, Instagram, and Kik. The best part is that Slash’s suggestions, auto-completes and prediction engine get stronger with repeated use. The main characteristic for Fleksy, available for both iOS and Android, is its versatility. When the mood strikes you (and you know how moody you can be), you can immediately change your typeface to something nearly illegible and then find and send GIFs and stickers to dress up your texts, emails and notes. A new version now includes a custom theme builder to facilitate even more extensive personalization. You can also use the app to customize your keyboard with extensions such as GIFs, hotkeys, cursor control, one-handed typing, imoji stickers, rainbow key pops and more. Fleksy is free in Apple’s A​pp Store​ or on G​oogle Play. In-app purchases are available for additional pre-made themes, but you’ll hardly need them. If you’re into flags, or need lovely renditions of them for work, school or your blog, this emoji keyboard for iOS features 208 flags from the world’s nations, listed in alphabetical order. Use it for texting, celebrating, or just studying national symbols. As you use the keyboard, recent flags appear at the top. There’s also one symbol from an extraterrestrial planet that doesn’t appear on the standard emoji keyboard. KwiltKeys lets you find and use your own pictures right from your keyboard, regardless of where your photos are located. It lets you text your Facebook photos, email your Instagram photos or Slack your photos stored in Dropbox without having to switch apps. KwiltKeys streams your photos from Apple Messages and Mail, Microsoft OneNote, Word and Powerpoint, Snapchat, Twitter, Google Hangouts, Inbox, Docs and Slides, WeChat, Line, you name it. Just sort, find your photo, tap to copy it, long press to get the Paste option and select. Emoji LINE has over 3,000 new and unique animated and character stickers and emoji to your default keyboard. The app incorporates hundreds of popular characters with diverse and varied expressions to communicate the inner you of the moment. So here’s a different take on emoji: personal emoji, meaning your own image rather than an illustration of something. Memoji links up with your camera and Camera Roll, letting you use your own photos or videos to create unique emojis. Built-in filters add a bit of flair to a dull or flawed selfie shot. The first three emoji are free — and you can swap out and change endlessly — but to fill additional variations, you’ll have to make an in-app purchase. 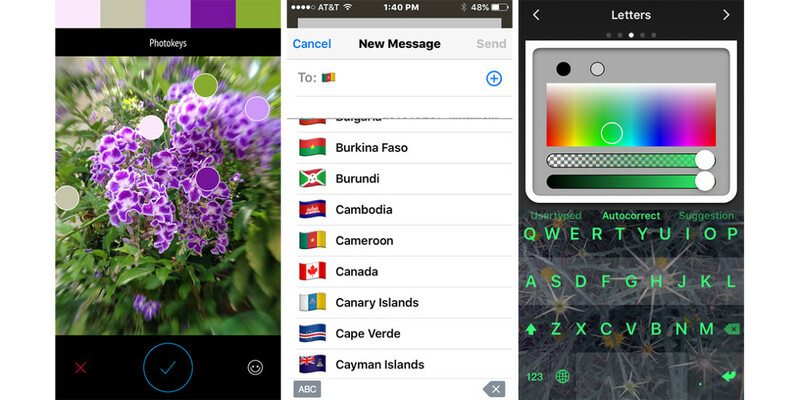 Of course you want to create custom keyboard color themes derived from your photos — right? With Photokeys, you can either shoot a new photo or pull one from your Camera Roll. The app automatically selects the major colors in the image and assembles them into a five-color palette. The app chooses the colors, but you can place the color markers wherever you want. A little smily face button lets you set the palette ‘mood’ to Bright, Indifferent or Dark. Each color is then assigned to a certain part of the keyboard: Background, text button background, text button color, functional button background and functional button text color. There’s an unlimited number of color combinations, so each keyboard is unique. The top 100 emoji emoticons are also available right from the keyboard. And for your $2.99 — one of the few keyboards that you must buy outright — you also get auto-correction and predictive input. Is it worth $2.99? I think so. KeyFeed is a free custom keyboard that lets you share and ‘like’ Instagram pictures from any app while texting, emailing or browsing the web. Tap once to share an image link or twice to like it or just scroll through the latest pictures in your feed. If you’re an Instagram addict, you will like this. There are hundreds of third-party keyboards for the iPhone and iPad, and this is just a tiny subset of my favorite visually creative ones. If you have a favorite that’s not listed here, please call it out in the comments.